Kaizen Events are an effective way to train organizations to break unproductive habits and adopt a continuous improvement philosophy while, at the same time, achieve breakthrough performance-level results. Through Kaizen Events, cross-functional teams learn how to make improvements in a methodological way. They learn how to quickly study a process, identify and prioritize improvement opportunities, implement change, and sustain their gains. Most importantly, they learn how to work with one another to solve problems rapidly and in a highly effective way. 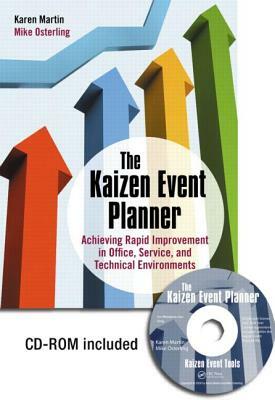 In The Kaizen Event Planner: Achieving Rapid Improvement in Office, Service, and Technical Environments, authors Karen Martin and Mike Osterling provide a practical how-to guide for planning and executing Kaizen Events in non-manufacturing settings, and conducting post-Event follow-ups to sustain the improvements made. Geared to continuous improvement professionals and leaders within the office areas of manufacturing, the service sector and knowledge-worker environments, this book provides the methodology and practical tools for generating measurable results, while building a motivated workforce and laying the foundation for continuous improvement. An accompanying CD provides immediate access to a number of Excel-based tools. Karen Martin is Principal Consultant for Karen Martin & Associates, which specializes in applying Lean principles and tools in office, service, and technical environments. She has provided Lean implementation support to organizations in a broad range of industries, including: construction, distribution, education, engineering design, financial services, government/military, healthcare, information technology, insurance, manufacturing, oil and gas production, and publishing. Mike Osterling is President of Osterling Consulting, Inc., a firm that leads organizations on their Lean journey. He has played a pivotal role in leading Lean transformations across a broad range of industries including aerospace, automotive, consumer goods, medical products, oil production, pharmaceuticals, and construction.